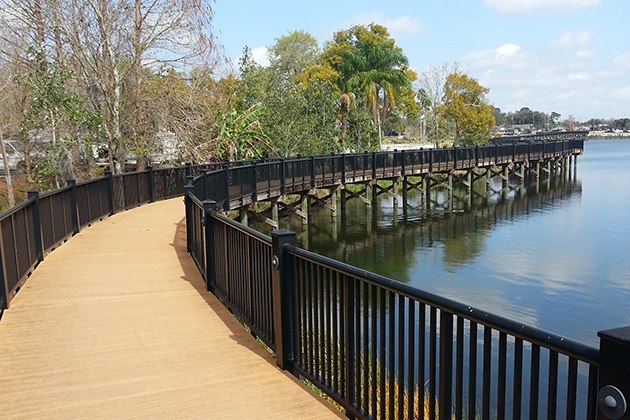 The boardwalks in Casselberry, Florida's Lake Concord Park use high-performance composite decking. 2017 brought one of the worst hurricane seasons in recent history. The United States' southeast region and the Caribbean — nicknamed "Hurricane Alley" — saw 17 named storms, including the infamous hurricanes Harvey, Irma and Maria, between June 1 and Nov. 30, according to the National Oceanic and Atmospheric Administration (NOAA). Apart from hurricanes, this region consistently has some of the heaviest rainfall of any area in the U.S. With weather patterns this severe, it is difficult to maintain any structures without the most durable materials and construction methods. Contractors who build decks, docks and boardwalks in Hurricane Alley face the challenge of recommending materials that can withstand high precipitation, temperatures and humidity. Surfaces constructed using traditional wood decking that are exposed to these extreme conditions are prone to splintering and warping, and require frequent repairs or replacements. Building with more durable wood-plastic composites provides a high-quality, longer-lasting surface, and helps create happy customers now and for the long term. What makes composite boards different? Scientists describe wood as being "hydrophilic" (water loving). In other words, it readily absorbs moisture, causing it to swell. This increases the potential for sheared screws and bowing or cupping of the boards. You've likely seen this with untreated wood decking that warps in high humidity or after extensive rain. High-performance composite decking boards are a natural fit for the intense weather exposure of Hurricane Alley, though. They provide attractive and durable decking that requires no painting or staining, and they will look beautiful for years to come. Because composite decking is made in part with wood fiber, some composite boards absorb moisture, depending on how fully the plastic encapsulates the wood fiber. It is technically difficult to ensure that moisture-resistant plastic fully encapsulates all of the wood fibers in a composite board, so decking manufacturers started adding protective plastic caps over their boards to help keep water at bay — hence cap stock composites. Although these plastic caps protect the surface of the deck boards, they may leave the ends exposed to moisture, and are susceptible to moisture intrusion where fasteners pierce the cap. To fully protect a composite deck, wood fiber needs to be fully encapsulated throughout the whole board. This encapsulation process ensures that composite decks can be installed in consistently wet environments without the risk of warping, splintering or rotting. Looking at an example from Pensacola, Florida, the Gulf Breeze Zoo undertook extensive upgrades to its 50-acre park, replacing 1,500 square feet of damaged wood with moisture-resistant composite decking. Completed in May 2017, the zoo now enjoys splinter-free, beautiful and durable decking that will outlast traditional wood boardwalks in the demanding climate of the Gulf Coast. 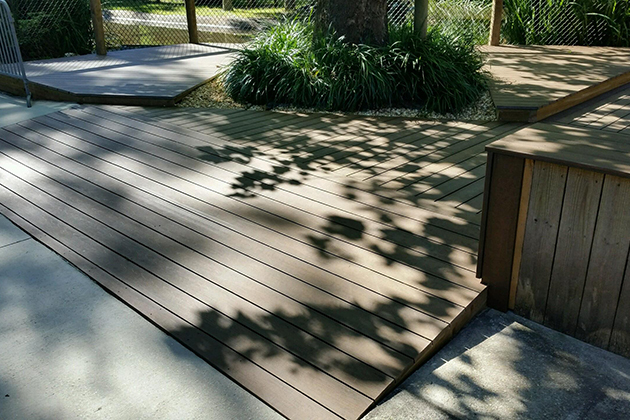 The Gulf Breeze Zoo in Pensacola, Florida, replaced its wood decking with beautiful and durable moisture-resistant composite decking in 2017. 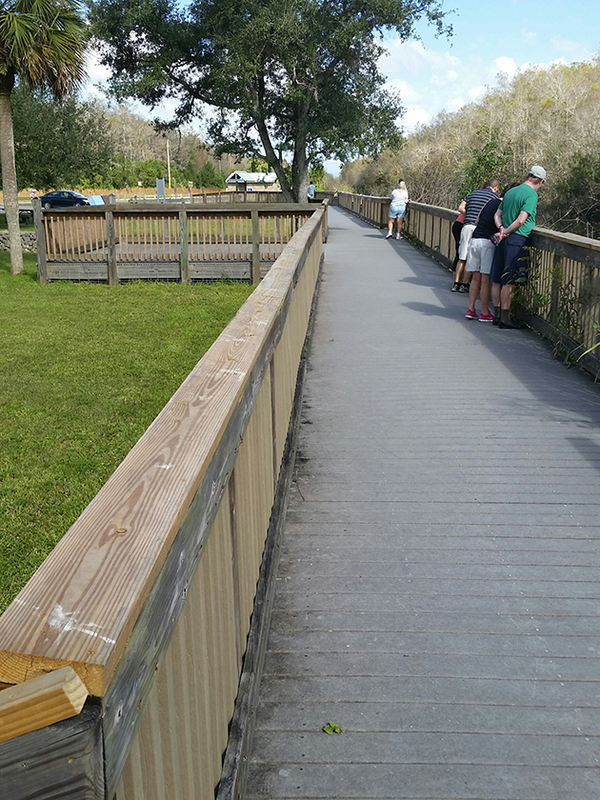 Demonstrating the decking's long-term durability, on Florida's southern tip adjacent to the Everglades, the Big Cypress National Preserve installed moisture-resistant composite decking on its boardwalks in 2004-2005. Since then, the composite decking has been subjected to approximately 700 inches of total rainfall, and was in the path of the 2005 Hurricane Katrina that devastated New Orleans. "Other than some moderate color fade, it is in as good a shape as when installed," says Dennis Bartalino, chief of facilities management for the preserve. "The associated handrails and balusters, made of pressure-treated yellow pine, have twisted, split and cracked, and much of that has been repaired or replaced." The composite decking installed in Big Cypress National Preserve in south Florida has withstood more than 700 inches of rain over more than 10 years, including 2005's infamous Hurricane Katrina that devastated New Orleans. Likewise, the high-performance composite decking has stood strong for nearly 30 years in other parts of Hurricane Alley like Padre Island, Texas, as well as other coastal regions including Cape Cod, Massachusetts, and Fire Island, New York. Hurricane Alley is as tough on building materials as its name suggests. The weather patterns stay relatively constant, but the products that are being used in this region to improve residential and commercial buildings' resilience to the elements are always improving. The use of composite decking provides contractors a durable alternative to traditional wood decking that stands tough against the elements of Hurricane Alley. Brent Gwatney is senior vice president for sales and marketing at MoistureShield composite decking. He has specialized in the building industry for more than 30 years, working with manufacturers, dealers, design professionals, contractors and building officials. Gwatney can be reached at brentgwatney@moistureshield.com.